For some reason, I was thinking that Logan Watkins was drafted in the 3rd round in 2008. He did sign for $600,000, which was probably 2nd round money considering the Cubs draft order that year (maybe even higher at that time), but he lasted until the 21st round. He had a strong committment to Wichita State. Watkins weighs 175 pounds and stands 5-11. He's right-handed and bats left-handed. He turned 24 years old on August 29th. The 2nd baseman had been better than league average at the plate prior to this season. Last year he had a very good season hitting .281/.383/.422. His wRC+ was 130. His first season of AAA didn't go as smoothly. He hit .243/.333/.379, which was good for a 90 wRC+. He was called up to Chicago at the beginning of August. After beginning his MLB career with 2 hits in 6 plate appearances, he's managed just 1 hit in his last 19. He's walked twice and struckout 10 times. Watkins has typically had a walk rate above average and has mostly kept the ball in play. His 40% strikeout rate so far at the MLB level is nothing to be concerned with yet. The sample size isn't very large. At AAA, he walked in 8% of his plate appearances, which was down from the 12.9% a year ago at AA. Watkins doesn't have a lot of power, but it's better than Matt Szczur's. He began his career with no home runs in his first two seasons and had just 6 of them over his first four. Those seasons totaled 1447 plate appearances. He's hit 17 over the last two seasons in the minor leagues (1060 plate appearances). It's been a disappointing season for Watkins, but he was still deserving of the call up. A recent scouting report for Watkins is difficult to find. He was drafted as a SS and has played 106 minor league games at the position. From what I recall, he was a below average fielder at the position at the time of the draft, which explains why he was promptly moved away from shortstop. He's also been an above average fielder at 2nd base and can play all over the field. He won't hit for much power, but has shown good discipline in the minors and could keep the ball in play. He has above average speed and has swiped more than his fair share of bases in his career. He stole 28 last year at AA and 21 the year before. He stole only 10 this year, though. While he won't hit a lot of home runs, his ISO is much improved over the early part of his professional career. Watkins will get a shot to stick with the team, but his role will depend on a couple of things. 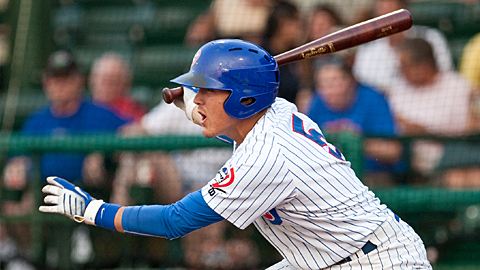 First, he's going to have to hit better than he has so far and second, I'm not as certain about Darwin Barney's role with this team as a lot of Cubs fans might be. Barney has hit so poorly this season (57 wRC+) that he makes Starlin Castro's 2013 offensive performance look impressive. I'm not convinced because I don't really know if it's possible to be so good at fielding that you can ignore how awful a hitter he is. Barney will be arbitration eligible after the season. How much do the Cubs really want to pay someone who is quite possibly the worst hitter in Major League Baseball? Can his fielding really be so awesome that you can overlook that? If the Cubs decide they can't overlook that, Logan Watkins will likely get an early shot in the spring training to win that job. To be fair, Cubs baseball is not the core subject matter of this blog. Anyone talking about cast iron today? So did the Cubs actually call anyone up? I liked what I saw from Rosscup. Probably slots as a LOOGY. Seems like he’s got a chance to make the team next year, especially if Russell is moved. Cubs are making a serious push for third place with these last two Ls. Go Cubs Go! Regarding the Race to the Top–Weakness of schedule has to be considered. Looks like the White Sox have an outside chance of catching Miami. I suppose the Cubs could too if they really tank against Pit, StL, and Milwaukee. But they are going to have to work pretty hard to catch the White Sox. Calling up Raley to pitch some more would help, I’d think. Once upon a time we talked about how it would make sense to have Castro at second and Barney at SS. Barney being the better glove guy. But then Castro became a good hitter and having some offensive production at SS was a better value. But then this year. So I wonder why the discussion of moving Castro to second, especially with prospects at SS, hasn’t returned…. If the Cubs cut/trade Barney this winter, there will be major hand-wringing in Cubland (except at OV). Cubs fans love their second-basemen. (See: Theriot, Ryan, and deRosa, Mark) That’s the curse of Ryno-the-trade-throw-in, I guess. 2b is a hallowed position, and all who play there will be great. I’m gonna go out on a limb here and say that if either Darwin Barney or Logan Watkins are starting at 2B this time next year, something has gone horribly wrong. Dave mentioned in another thread he was having some login issues. Anyone else having them? I was able to logout and login again without issue.